love for a very special (and beautiful) person, a person whom we've heard and seen so often on our radios/tv's. Yes, it's the one and ONLY Deborah Harry a.k.a. 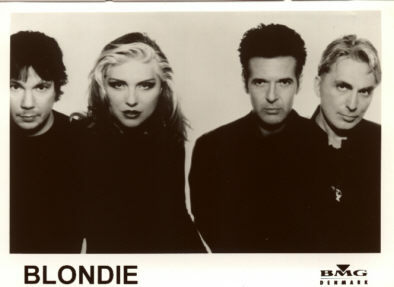 Blondie a.k.a. Debbie Harry. May she live forever and never lose her beauty ! Although "Blondie" was very much associated with the lead singer (Debbie Harry), we must not forget that the band "Blondie" was much more than just Debbie, people like Chris Stein, Jimmy James Destri, Clem Burke, Nigel Harrison and Mike Chapman were indeed VERY influential in the "sound" of the band and many of them were co-writers on the lyrics. If you have a release that I haven't got in my collection (God forbid it), you are VERY welcome to contact me, maybe we can make a trade and if not, then I might consider buying it. This 80's Music Ring site owned by Jimmy Dahl Pedersen. Debbie has been visited times.